Jut Group develops high-quality commercial activities dealing with architecture, interior design, furniture, art and culture. 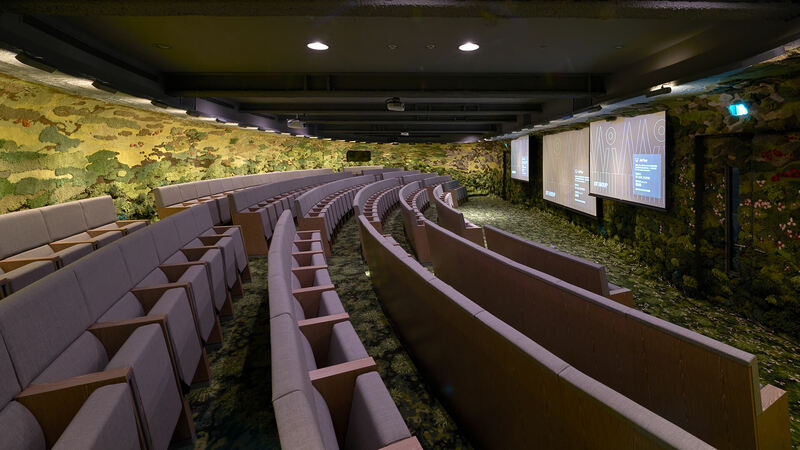 The 240-mq lecture hall, situated at the group headquarters in Taipei (Taiwan), can hold up over 200 people. The installation design concept is based on MVRDV, an architecture and urban design practice in Rotterdam, and The Why Factory researches on the potential of future convertible spaces and underlines Jut commitment to collaborate with highly talented artists, designers and architects. 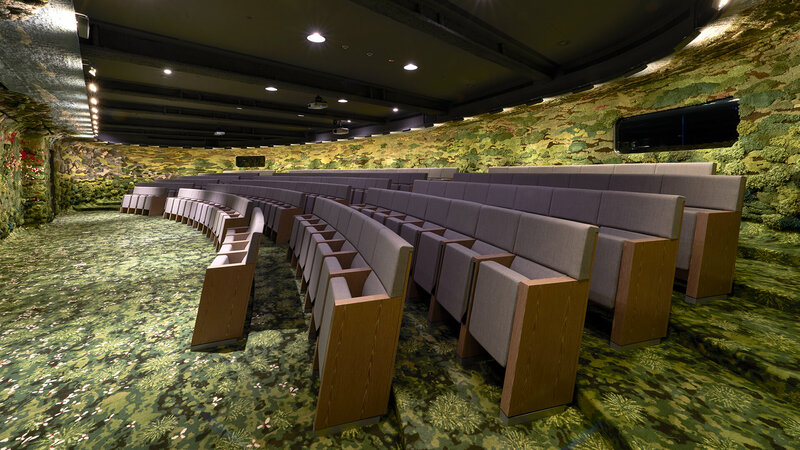 “The interior looks like a green dream surrounding the audience”, says Winy Maas, the co-founder of MVRDV. 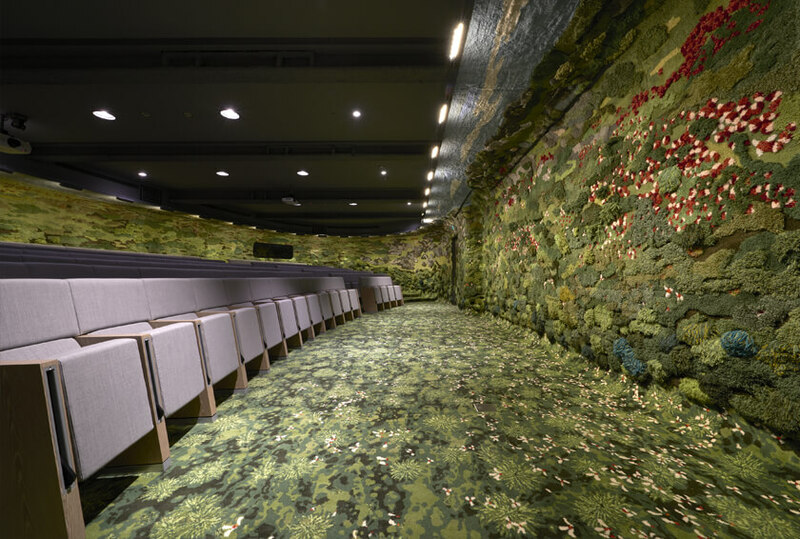 The hall is a work of art, which represents Taiwan natural landscape and, at the same time, meets the functional requirements of acoustics. 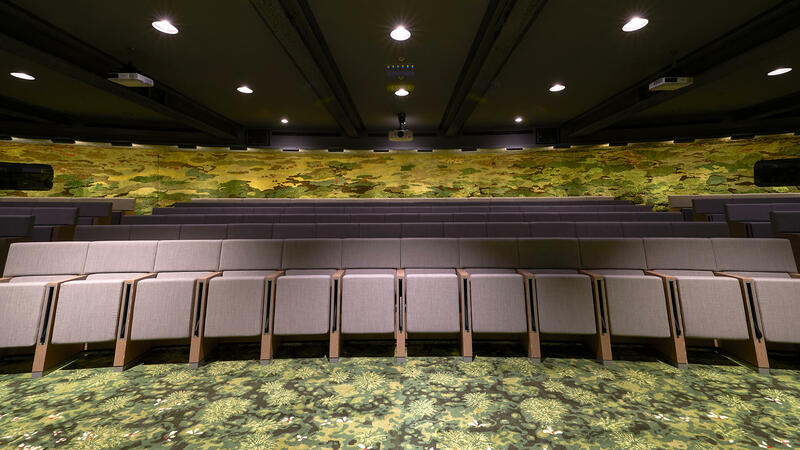 The key element of the new lecture hall is the outstanding wall covering inspired by nature, created by Alexandra Kehayoglou, an Argentinian textile artist who transformed Jut Group lecture hall into a functional, comfortable and great impact space. Designed as a real art installation, the structure has been manufactured in Buenos Aires at the weaving mill of Kehayoglou’s family, by using waste yarn and a handmade quilting technique, which has taken more than a year of work. By reproducing natural elements such as musk, water, trees and meadows, the covering creates a fabric wood, which extends from the floor to the walls, thus offering a unique atmosphere. To arrange the lecture hall, MVRDV architecture practice has chosen the L213 armchairs by LAMM, standing out for their linearity and compositional rhythm, but also for their extreme comfort, into the original layout. L213 armchairs, upholstered with Remix 2 fabric by Kvadrat, have been supplied in the version with inclined sides and installed in curved rows, with no gaps between the panels in order to ensure the backrest continuity. Sides and rear-backrest are made of plywood with grey oak finish. Moreover, the right sides are equipped with tip-up writing tablet with anti-panic movement.